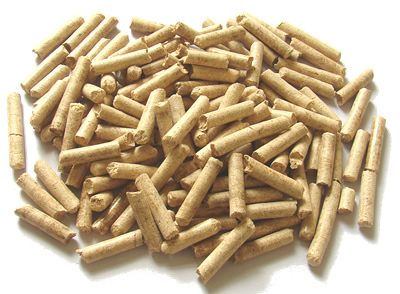 Wood pellets are a type of wood fuel, generally made from compacted sawdust. They are usually produced as a byproduct of sawmilling and other wood transformation activities. The pellets are extremely dense and can be produced with a low humidity content (below 10%) that allows them to be burned with a very high combustion efficiency. Further, their regular geometry and small size allow automatic feeding with very fine calibration. They can be fed to a burner by auger feeding or by pneumatic conveying. Their high density also permits compact storage and rational transport over long distance. They can be conveniently blown from a tanker to a storage bunker or silo on a customer's premises. As the price of heating with fossil fuels increases, more capacity for pellet heating has been installed. A large number of pellet stoves, central heating furnaces and other heating appliances have been developed and marketed since about 1999. With the recent surge in the price of fossil fuels, the demand has increased all over Europe and a sizable industry is emerging.